Yamilka Ramírez cuddled her eight-year-old daughter Celine while sitting on a cardboard bed under a makeshift shelter set up in the Costa Rican customs building next to the Peñas Blancas border post with Nicaragua. "We've sacrificed everything to get here," the Cuban nurse told VICE News, explaining that she had sold her home and all her belongings in an effort to make the journey to the United States. "We are leaving hard times in Cuba you know, very hard times...If they send us back, I don't know, I don't know." Ramírez and her daughter are among around 2,500 Cuban migrants currently stuck in Costa Rica unable to continue their planned journey to the US because Nicaragua has stopped allowing them through the country. These stranded Cubans are part of a bigger surge in migrants from the island who typically fly to Ecuador, where they do not need a visa to enter, and then head north by land. The surge reflects fears that the special rules allowing Cubans to remain if they reach US soil — the so-called "wet-foot, dry-foot" policy — will soon change thanks to improving bilateral relations. Secretary of State John Kerry has said there are no plans to revise the existing rules, but many Cubans don't believe him. The problem on the Costa Rican/Nicaraguan border began last Sunday when the Nicaraguan army pushed back a group of about 800 Cubans and then closed the frontier to Cubans in general. With around 100 more entering Costa Rica every day through its southern border with Panama, the problem is getting bigger. "We can't do this for much longer," Costa Rican Foreign Minister Manuel González told VICE News. "We have never had a natural disaster that has required so many shelters," he added, referring to the seven shelters the government has set up around the country to house the stranded Cubans. "Our capacity will be saturated very soon." González wants the nine Latin Americans nations on the Cuban route — Ecuador, Colombia, Panama, Costa Rica, Nicaragua, Honduras, El Salvador, Guatemala, and Mexico — to negotiate a special arrangement allowing Cubans to travel legally through their countries to the United States. He calls it a "humanitarian corridor." "They don't want to stay here they want to go to the United States," González said. "But the reality is that they are here and if the border remains closed for much longer they are going to start putting themselves in the hands of unscrupulous people traffickers and that is what we don't want." The bilateral relationship between Costa Rica and Nicaragua has long been chronically tense and the Costa Rican government has alleged that Nicaragua's decision to close the border to Cubans obeys a political strategy to stir things up further ahead of two imminent rulings in the International Court of Justice in the Hague on unrelated border disputes. The Nicaraguan government, meanwhile, justified its position last Sunday as a reaction to Costa Rica "throwing thousands of Cuban citizens at Nicaragua's southern frontier in a deliberate and irresponsible act." Later statements by Rosario Murillo — the government spokeswoman who is also the wife of President Daniel Ortega — suggested that Nicaragua is also seeking to draw attention to the deep disparity between the way Cuban and other Latin American migrants are treated both on their journey and once they get to the US. "We all know that we should demand reciprocity from the United States so that our migrants receive the same fair, dignified and human treatment they deserve and that is being requested for the illegal Cuban migrants," she was cited as saying in the pro-government news website 19 digital on Friday. "The truth is that our peoples have suffered enormously as a result of the humiliations to which they are submitted when they seek to live the American dream." The Cuban government, meanwhile, has remained silent on the subject aside from a statement released by the foreign ministry on Tuesday that directly blamed the situation on the special laws allowing Cubans to stay in the US "even if they reach the territory in an illegal way." "The foreign ministry reiterates, once again, the need for the withdrawal of the "wet-foot, dry foot" policy," the statement said. All the Central American players are due to meet in El Salvador next Tuesday to discuss the problem within the context of a ministerial-level gathering called by the Central American Integration System. The foreign ministers of Ecuador, Colombia, Mexico, and Cuba are also expected to attend. 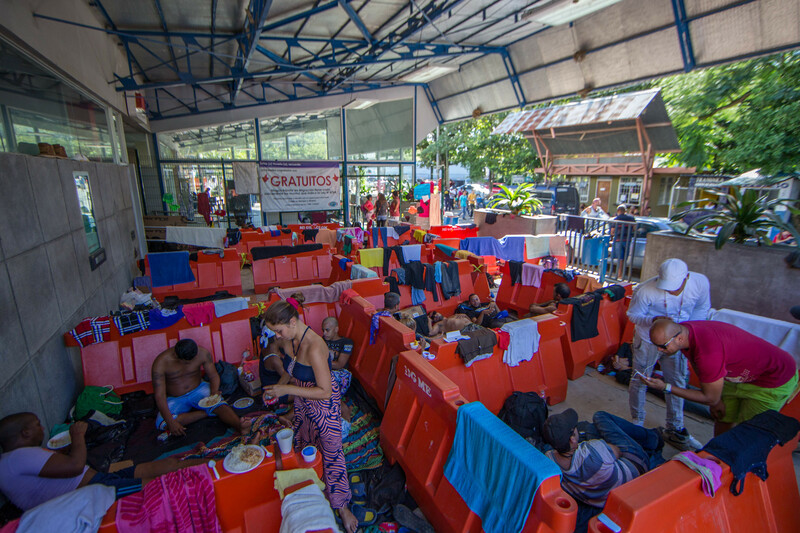 With little to indicate what the results of the meeting will be, anxiety is rising among the Cubans camped out in the Costa Rican border post shelter. "We are supposedly in transit, but more or less we feel like refugees," said 24-year-old Mario Martínez Catasus, taking in the scene around him in which many whiled away the hours checking their phones, playing cards and sharing meals of chicken, rice and beans provided by aid workers. Out on the road in front of the building, Nelcy Lorenzo Pérez and her husband Julio Costillo Cortes lay on a small square of black plastic. "We don't know what will happen, we are really anxious and desperate," said Pérez, a former computer programer who added the couple had spent a month getting to this point from Ecuador and found themselves having to pay large bribes to get through Colombia. "We are so afraid of the possibility of having to return to Cuba."